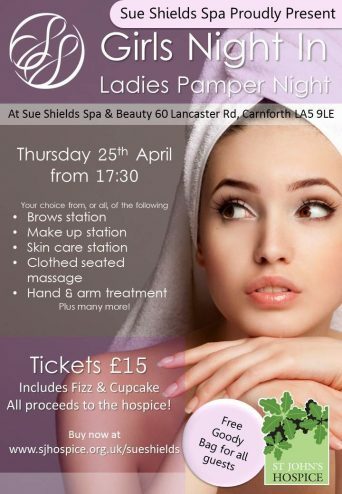 Our brilliant supporters, Sue Shields Spa are putting on a glamorous girls night in aid of the hospice! Come along for product demos and sample sessions in make up, skincare, eyebrows, clothed seated massage, hand & arm treatment and much much more! All ladies will also receive a glass of fizz, a homemade cupcake and free goody bag to take away and really pamper themselves. Tickets are £15 and there are only 50 available so don't miss out!